My side project, Penguins Creative, evolved from my doodling habit since high school. I was always drawing little illustrations of penguins and my daily life. In 2014, I committed to a one-day-a-page journal since 2014 called the Hobonichi Techo. In this journal, I would doodle, sketch, paint and utilize crafting materials to document adventures and explorations from my daily life. From this process, I’ve cultivated a formidable following of friends and audience that like to see my daily scrapbooking, sketches and journal entries in my diary. 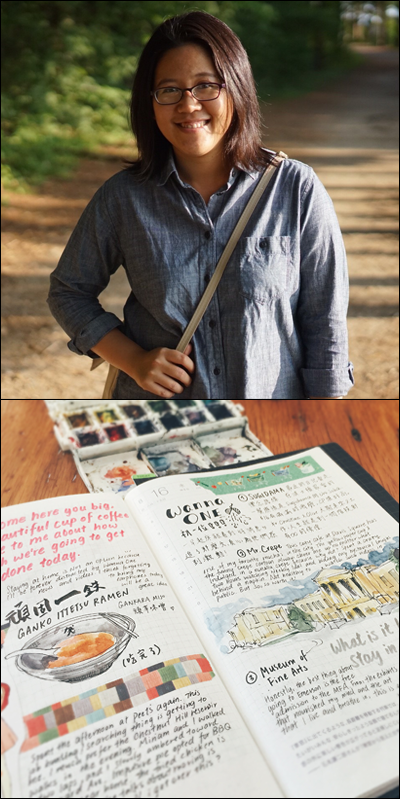 Penguins Creative became my platform to showcase my passion for urban sketching and creative journaling—together I dubbed it Urban Journaling—exploring the world through writing and art. At Instagram, I realized that there are many people who are interested in the same thing as I do all over the world. I decided to see if I could meet people offline to share this passion. Soon, I began reaching out on the internet and hosted many meetups around the world to engage and play with like-minded stationery addicts, including Taipei, Tokyo, Boston, New York, Seattle and Chicago. Just like people who would find jogging or other activities therapeutic, my meditation lies in art and crafting. The creative flow I get from each session of journaling or urban sketching is profound and energizing. I make time to go out and sketch with friends each weekend at different parts of the city, making it a social event as well as an art break. Every night, before I sleep, I dedicate at least an hour to write in my journal, dressing up the day with little quotes and interesting tidbits I found. In my travels, I try to incorporate my passion for stationery into my itinerary and share it with my followers at Instagram. The fun thing about a side project is that it is not serious as work. Just like what people say about work-life balance, a side project is something that you do for fun, that you play with. Through Penguins Creative, I discovered that being passionate about something also makes you bold and adventurous. In my meetup experiences, I learned to chat with strangers and share new ideas. Engaging with friends around the world is my biggest takeaway from this side project. Diptych courtesy of April Wu.